A very fun mail day! I talked to a company on Thursday about the felting and felt products that they carry and they said that they would mail one of their product kits to me. I was shocked to receive it two days later – WOW!!! They have some very nice products and have been in business for 100 years! The second fun item was the prefelt sheets that are sitting on top of the pile. There are 22 colors and the squares are 10″ x 10″. I ordered the sample kit to experiment with this product and see the colors. They can be cut and wet felted with other fibers, needle felted together, felted further by themselves and sewn together, etc. The colors are very vibrant and I am hoping to play with them later this week. Depending on how they work, the company sells them in 10″ x 80″, 30″ x 80″, and 60″ x 80″. The last item was my micron testing results! 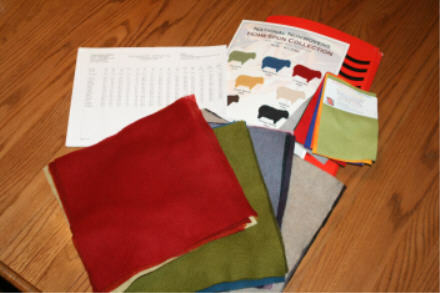 Thanks to Michelle at Boulderneigh I was able to send in 17 samples to be tested. She posted on her blog about the very reasonable testing done at Texas AgriLife Research Center. The results are interesting and I am really surprised by some of them. I found a great site for definitions on the 15 numbers that came back on each sample. 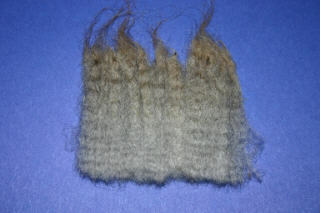 This is a picture of Darby’s fleece sample, her micron count is 27.9. Her daughter Chevelle’s is 28.2 and her other daughter Liberty’s is 27.7. I expected Darby’s fleece to be in the 30’s and was surprised that it was in the 20’s. This is Harley’s fleece and looks and feels very different from Darby’s, but it measured very close to the same – 28.7 microns. I would have bet money that Harley’s fleece was a finer micron count than Darby’s. I tested Wrangler’s lamb fleece and it measured 24.8 microns, I had his adult fleece tested this time and it came back as 31.8 microns. The desirable range in the Jacob Breed Standard is 26.4 to 36.19 and the acceptable is 23.5 to 38.09. Our samples range from 24.5 to 36.6 with the average being 29. Isn’t it interesting to see “scientific” numbers put to what we see and feel? I am eagerly awaiting spring shearing to do everyone at once. Sometimes it’s hard to quess what micron range your fibers are in so testing is surely the best way. 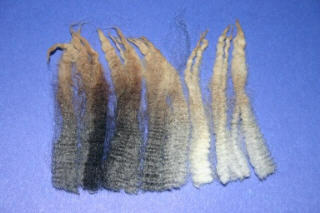 I got my sheep sheared last night so I will be sending some samples in soon. I have read that 30 microns or less is appropriate for next to the skin garments and the other ranges are good for outer wear. I have seen where you can get the colored felt sheets and take a fine dog brush and brush them into roving to needle felt with. What fun! I would love to do micron testing on my sheep this spring. I suppose they only do it for Texas sheep? I could do the angora goats too.